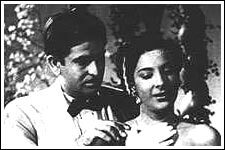 Raj Kapoor's cinema spoke the language of love. What made his earlier films riveting was that they layered the complexities and densities of romance with a socio-political thrust. In Awaara, a down-on-luck thief's love for a righteous heroine help his quest for his higher self. This proletariat's aspirations, as represented in the lyrics of the dream sequence: Mujhko yeh narak na chahiye; mujhko phool, mujhko geet, mujhko preet chahiye [I don't want this hell; I want flowers, music and love], amidst salvational images of the heroine beckoning him from heavenly clouds, lead to the belief that love uplifts. It's a pan-universal sentiment that led to this blockbuster classic sweeping people off their feet even in Russia and China. Kapoor based Awaara on the Nature versus Nurture debate about the causal stimuli for human behaviour. Judge Raghunath (Prithviraj Kapoor) staunchly believes that a thief's son will always be a thief and a good man's son will always turn out good. In a series of flashbacks, the film showcases the stormy repercussions of this belief. An advocate practising in Lucknow, Raghunath is devastated when his wife Leela (Leela Chitnis) is kidnapped by the dreaded dacoit Jagga (K N Singh). When Jagga learns of Leela's pregnancy, a heinous plan for vengeance crystallises in his mind and he lets her go unmolested. Once Leela returns to her home, the seeds of doubt about the parentage of her baby are planted in Raghunath's mind and he evicts her from his house. A hapless Leela gives birth to her son on the streets. The cinematography accentuates the horror --- the partly-lit wet, cobblestoned street and the sinister shadows just like the film noir of the 1940s. Unprotesting of her fate, Leela brings her son to Mumbai. A cute Shashi Kapoor in his only child's role plays the young Raj. His mother wants him to be an advocate like his father, but Raj shows defiance. Notice how he secretly ruffles his hair after his mother has neatly oiled and combed it. The ever present spectre of hunger sees Raj forsake his best intentions to stick to the straight and narrow and become victim of Jagga's evil plans to prove his father's doctrine wrong. Under Jagga's tutelage, the judge's son grows up to be the titular awaara (Raj Kapoor). The sartorially well turned out Raj encounters rich lawyer Rita (Nargis) first as a possible prey for his thievery. But when he discovers that she is his childhood friend, the two fall in love. He euphemistically tells her, "Rupaye ki len den hi hamara dhanda hai." But Rita awakens Raj's buried feelings of shame at his profession when she teasingly calls him junglee, while gambolling on the beach. In the famous sequence, Raj slaps her ruthlessly. While one wishes Rita could have been more assertive in the face of this violence, one presumes that for Raj, hitting her is like hitting himself. Raj's real anger is at the unattractive side to himself that Rita's love has made him acutely aware of. There is now a tug-of-war for Raj's soul, brilliantly expressed cinematically in one of the best dream sequences ever --- in the twin songs Tere bina aag yeh chaandni and Ghar aaya mera pardesi. In a surreal recreation of heaven and hell, Raj tries to escape the hell created by Jagga and climb the steps that lead him to Rita and salvation. Raj's reformation is not easy. He gets no work and Raghunath (now an embittered judge and Rita's guardian), continues to condemn him because he has no father. But Rita, even after she learns that he is a thief, continues to stand by his side and exhorts him to change. When Raj murders Jagga while attempting to save his mother from his clutches, Rita defends him in court. It takes a further tragedy before both father and son can expiate for their respective sins in a moving denouement. For Kapoor, Awaara's success was an affirmation of his gift for direction. It helped that he surrounded himself with exceptionally talented people like writers K A Abbas and V P Sathe, cameraman Radhu Karmakar and art director Achrekar. Awaara's expensive-looking sets and locations deserve mention --- even the prison cell is dungeon-like; and the interiors of Prithviraj Kapoor's baroque mansion have to be seen to be believed. The dream sequence sets are elaborate. Apparently, the entire song took three months to shoot. The portrayal of romance too is memorable. My favourite scene is the one where a scruffy-haired Raj chases a beribboned Nargis on a boat till she warns that if he takes one more step towards her the boat will capsize. Nargis capitulates with Doob jaane do. It captures the spirit of abandon that characterises the rich Rita's love for her awaara; and of romance. Raj and Nargis together are magical. Nargis exudes vitality. She is exceptionally good in the party scene where she goes from delight to a dawning realisation that her lover is a thief --- without uttering a word. Raj Kapoor has never looked as handsome and charismatic in his subsequent films. Unfortunately, he let himself go physically all too soon. * Awaara was a sensation when it released in 1951, but its fame multiplied when it was released in Russia as Brodigaya in 1954, and two nations dueted to Awaara hoon. Raj and Nargis were feted wherever they went in Russia. * After Awaara's success, Raj worked exclusively with Nargis for next five years. His next film without Nargis was Sharda (with Meena Kumari) in 1957. Nargis, too, signed films only with Raj at this stage. *Awaara was the first film to be shot in Raj's newly-built RK studios. * Shanker Jaikishen entrenched themselves in the RK camp after following up Barsaat with the hit score of Awaara. Kapoor's picturisations also deserve a mention. During the club song Ek do teen, the decibels rise and fall as raucous noise and laughter drown out the song for a while. * Interestingly, the strains of the tune of O basanti pawan pagal are heard in a couple of places in the film. Kapoor used the tune a decade later for Jis Desh Mein Ganga Behti Hai.